Old Tbilisi Garden has a pedigree that shouldn’t be totally new to my readers. 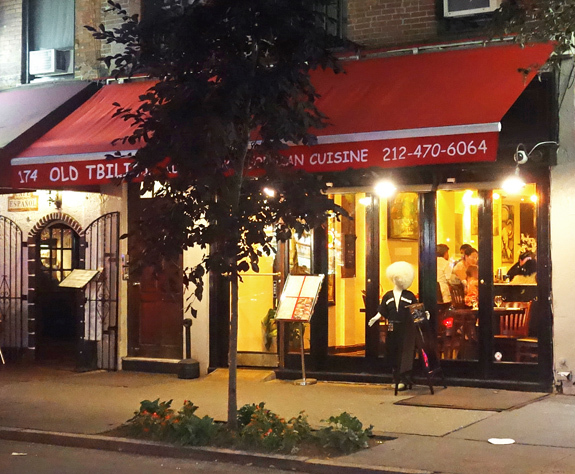 Apparently, part of the team is comprised of none other than the former owners of Tbilisi in Brooklyn, which I reviewed here a few years ago. After selling their old restaurant and spending some time in the kitchen at Oda House, they moved to their new digs in July. 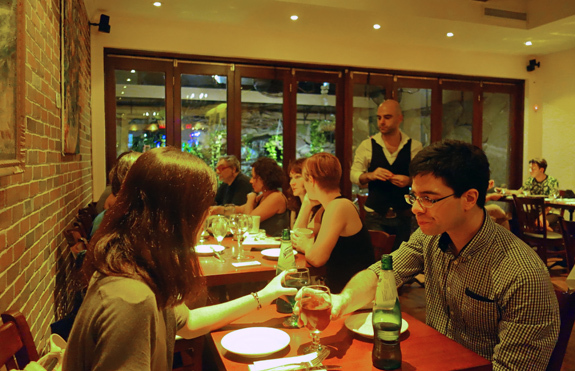 The interior adopts the simple but functional decor typical of many restaurants in the neighborhood, with the addition of contemporary Georgian paintings (for sale) hanging on the brick walls, and a few tables in a small “garden” at the rear behind a glass divider. 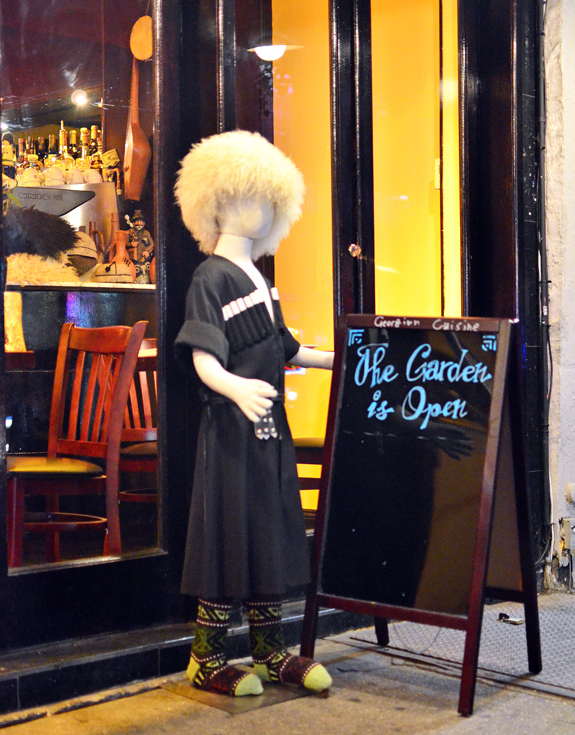 A mannequin in traditional garb stands on the sidewalk out front, giving another hint that this isn’t yet another Italian or Asian joint. The menu is almost 100% Georgian and quite exhaustive. Count over a dozen appetizers from salads to sturgeon satsivi, the usual baked goods, a few soups, another dozen entrées with a lot of meat stews next to the expected dumplings and the occasional baked fish, a grill section with various meat and fish kebabs, and finally a handful of desserts that could almost make me forget that I’ve criss-crossed Georgia more than once and don’t remember ever being offered any kind of cake. As usual with Georgian restaurants, I’ll start my review with the khachapuri. The three most classic variations are on the menu, and rest assured I tried them all. The menu also included shoti, a tandoor flatbread, and mchadi, corn bread. First, the Imeretian khachapuri. The dough was OK but not great. I felt like it lacked flavor a bit, and was slightly too thick. On the other hand, the generously portioned cheese filling tasted good. It seemed to be 100% sulguni, hence a stringiness that’s just right. I would just add a bit more salt, to both the cheese and the dough. 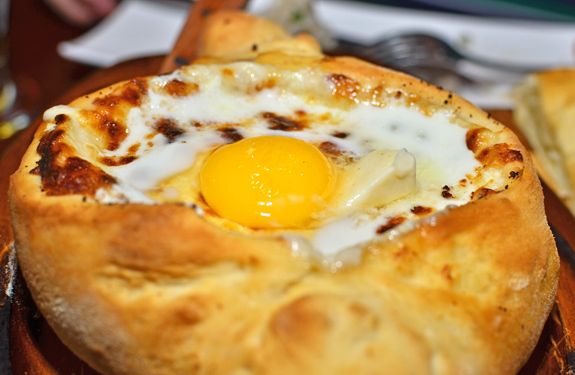 This was a good Imeretian khachapuri overall, but it didn’t beat the one from Oda House. 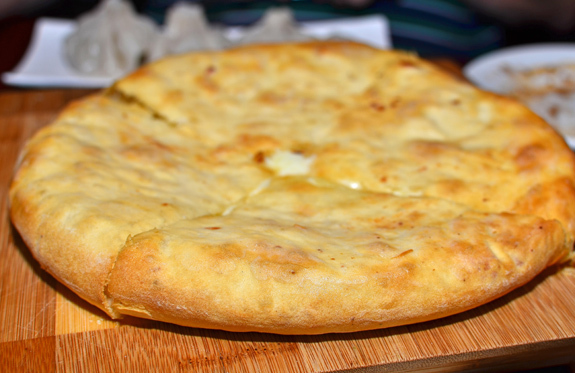 It came as no surprise that the Mingrelian khachapuri fared better. 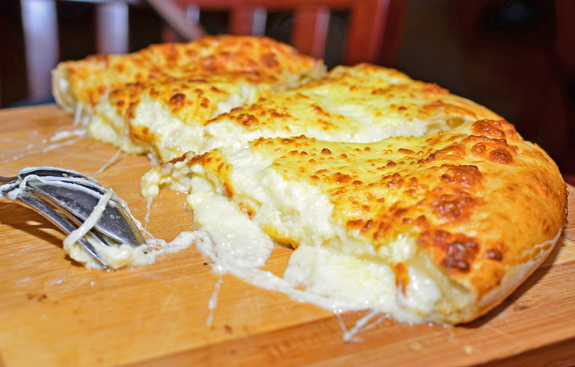 The dough was the same as in the Imeretian version, but the extra cheese on top of the bread made up for it. This was almost “too much” — don’t expect to have room for much else after eating one of these! — but it might have been the most satisfying of the three khachapuri. The Adjaran khachapuri seemed to be made with the same ingredients again, plus the egg and the butter, but struck just the right balance between the bread and the cheese. Should it really be made with the same dough as the others, though? I always tend to think of Adjaran khachapuri dough as something closer to pizza dough: airy, crispy, and flavorful. The appetizer section contained both classics and some more exotic entries such as khizilala (cucumber rolls filled with caviar) or zutkhi (“marinated fillet of sturgeon with lemon and olives”). 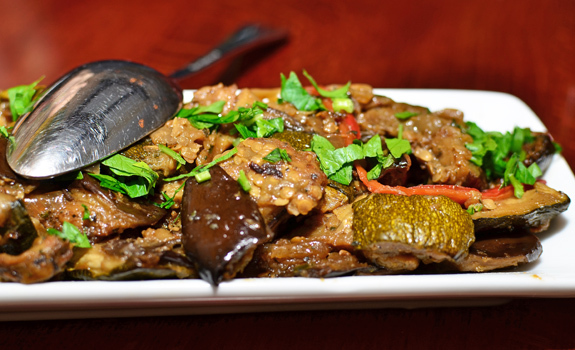 The Adjapsandali was your typical “grilled eggplant, bell peppers, zucchini, tomato, garlic, onion seasoned with Georgian herbs and garnished with freshly chopped cilantro”. Nothing extaordinary, but pretty nicely done — except for the lack of salt. The amount of oil was just right; unlike similar Italian dishes, the vegetables weren’t floating in it. The satsivi was available with either chicken, sturgeon, or salmon — we tried chicken. The tender cubes of chicken breast, coated with a mild but tasty walnut sauce, were served at room temperature (satsivi can be served hot or cold). 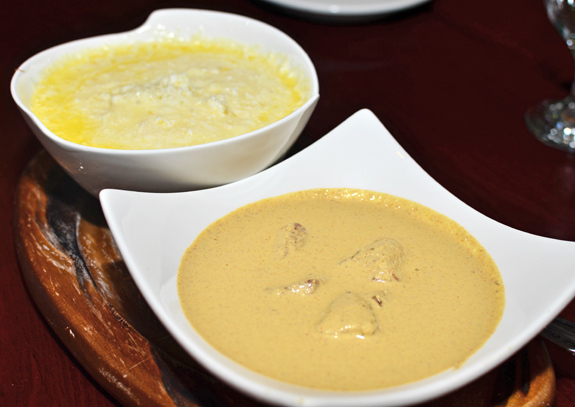 On the side came a large bowl of elardji, white polenta with sulguni cheese on top. Way too much polenta, and save for the cheese, way too bland. Maybe tradition demands that the polenta be served without salt, but modern common sense suggests otherwise. 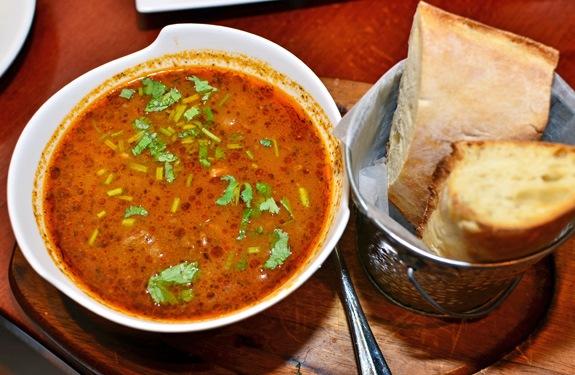 The warm lobio (bean stew), also came with its own side, making the dish more like an entrée than an appetizer. The red beans were chopped into pieces, which was kind of weird, and cooked in a thin, spicy sauce. 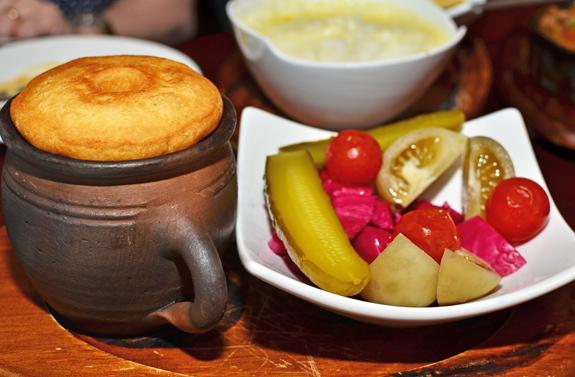 A layer of unsalted and very heavy corn bread (a kind of mchadi) topped the clay pot it was served in. The side consisted of pickled vegetables, a nice pairing choice. The vegetables were all pretty good, especially the cherry tomatoes. We appreciated the restaurant’s effort to serve complete dishes with garnishes, although the sides should have been a bit smaller. The kharcho, a soup with very tender beef and a little bit of rice, wasn’t especially memorable. The bouillon was pretty thin and not very flavorful, tasting mostly of beef and just faintly of dried herbs, plus the sprinkling of fresh cilantro on top. On the other hand, the khinkali (meat dumplings) were a real success. The beef and pork mixture was airy and juicy, if only missing a hint of spice. Most importantly, the dough was relatively thin, unlike what seems to be customary in other restaurants. 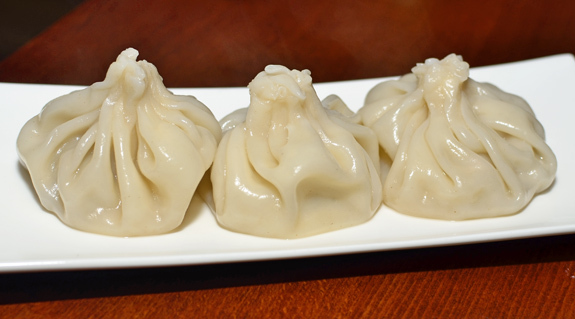 These were certainly some of the best khinkali in NYC, if not beyond. In the grill section, the kebabs used more than just lamb, giving you additional choices of chicken, pork, salmon, and sturgeon. 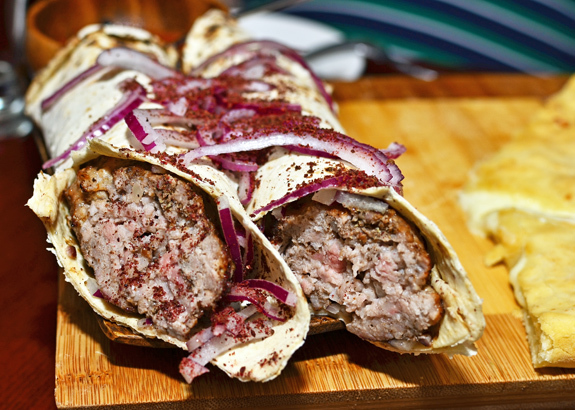 The huge pork lyulya-kebab reminded me of its counterpart at Toné Café. The ground meat was flavorful, not dry at all, and not overcooked — in fact, the pork was even slightly pink inside, as per my request! In the Georgian style, the kebab was much bigger than the Azerbaijani or Uzbek versions. Combined with the lavash, thin onions, and sumac, this was a very successful dish indeed. 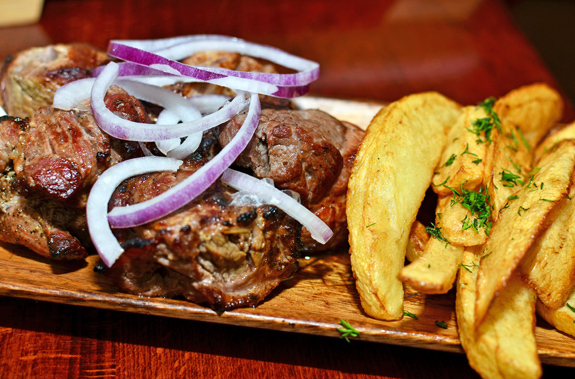 The lamb mstvadi (kebab) was also ordered rare, but this time the request was completely ignored. Not surprisingly, it arrived medium well and slightly dry, though at least still tender. I can only presume that the result would have been much better if it was less done. The mstvadi was accompanied with the usual tkemali (sour plum sauce) and too-thickly-sliced red onion. The country style fries sprinkled with dill were very soft but did have a nice potato taste. Next came the entrées not from the grill, somewhat randomly divided between “National Entrées” and “Other Hot Entrées”. Here you’ll find a variety of stews, which are some of my favorite Georgian dishes when they’re not saturated with herbs or garlic. There’s even a kuchmachi, made with offals, adjika, and polenta. 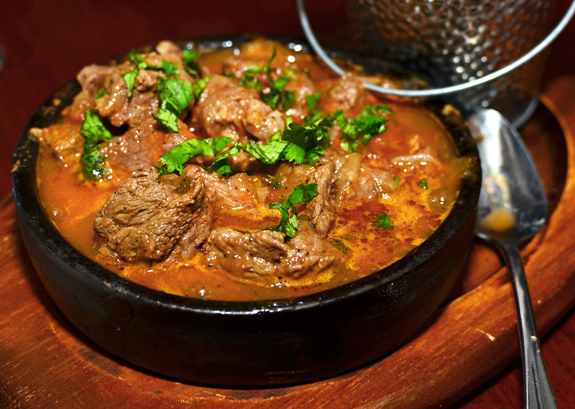 In the chashushuli, flavorful and extremely tender veal cubes were simmered with tomatoes and onions in a clay pot. I wish there had been more chunks of vegetables, but overall it was really quite good. A basket of toasted shoti, the traditional crispy Georgian flatbread with an airy crumb, was perfect for mopping up the sauce. The sauce also worked great for dipping our overcooked lamb kebabs! 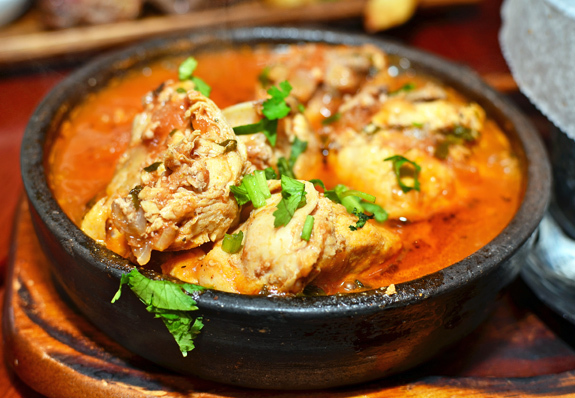 The chakhokhbili was a similar stew, but with chicken. Same rich sauce with tomatoes, onions, herbs, and spices. The chicken was cooked to perfection, both moist and very tender. Excellent. 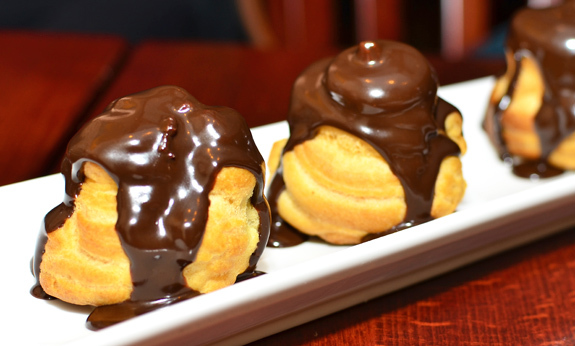 Old Tbilisi Garden offers a few desserts, which is great in theory but not always in practice… The chocolate cream puffs looked exactly like profiteroles, except they were filled with a kind of bland pastry cream instead of ice cream. Anybody would agree that the former is definitely inferior to the latter. In any case, the puffs themselves were also very dry, and the chocolate sauce was both mediocre and scarce. 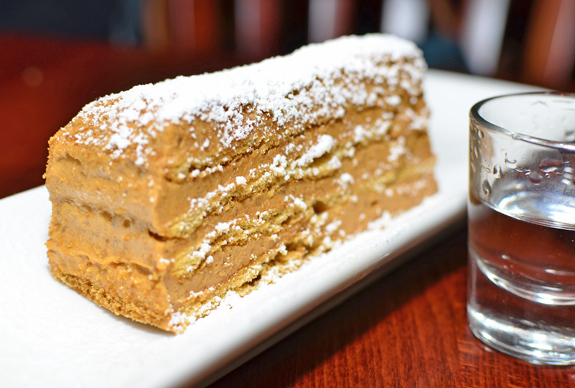 The Ideali, a rather rare Georgian dessert on this side of the Iron Curtain, consisted of a layered cake with a rich walnut cream (possibly a butter cream?). The result was pretty heavy, especially after a big meal, but not unpleasant. The same flavors with an airier substitute for the cream could turn out quite interesting. The drink list boasts a small selection of Georgian wines, most of them available by the glass. The whites and reds I tried were generally fine, though nothing really went off the beaten path. I did spy a Georgian cognac on the bar shelves, and they have chacha, the equivalent of Italian grappa but with a taste of rubbing alcohol. This isn’t as bad as it sounds — just wash it down with pear soda or Tarkhun! All in all, the food at Old Tbilisi Garden is quite good. It will be even better if they can figure how to tweak the dough for their different khachapuris, cook all of their kebabs to the right doneness, and revise some of their desserts (especially the non-Georgian ones). The atmosphere is right for the neighborhood (unlike at Ariana) and service is decent, if sometimes a little funny. The restaurant was pretty crowded during all of my visits, so people seem to agree that the place is doing something right. Old Tbilisi Garden has a lot in common with Oda House. They have similar menus, and quality-wise they fare more or less the same, with different strong and weak points. The stews are real winners at Old Tbilisi Garden, while Oda House has the better khachapuri. With a little effort (and a big stomach), you could go restaurant hopping and grab the best of both worlds! Hi Julianna, the only Georgian restaurant I know in France is la Maison Géorgienne, reviewed here.